More crime than one player can handle. The core is solid, but there's simply too much bloat. What is it? A management game about running a police force. In This Is The Police, Jack Boyd spent his last days as Freeburg police chief in a frenzy of corruption, trying to keep the city clean while also working with the Mafia and collecting as many kickbacks as he could. In an all too realistic move, the sequel sees him evade justice and slip into a new job advising the Sheriff of a small town police force. Which, it turns out, is not an easy retirement at all. In theory, this is a strong setup for a story. The snowy town of Sharpwood has a Fargo-esque vibe (and a Fargo-esque crime rate) that serves as a nice change of pace from the big city of Freeburg. 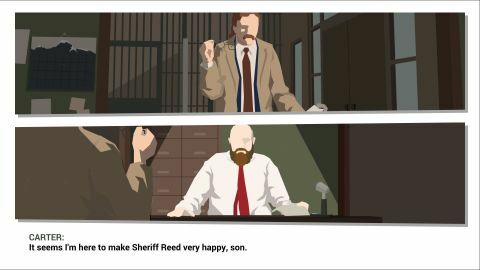 In practice however the game has a penchant for rambling Tarantino-esque dialogue that goes on far, far too long. Every conversation feels full of fat that can be cut, like an early scene in which Boyd and a door to door salesman have an extremely long winded chat about toilets that may or may not be a veiled threat. It’s a crying shame because the voice actors are doing a terrific job, but I found myself tuning out long before they got to the point. At first the story feels like it’s going to be about Sheriff Reed’s struggles with institutional sexism, as she’s constantly receiving misogynistic comments from both co-workers and criminals. But when Boyd arrives he takes over both as leader and as protagonist, and the focus shifts towards him and his web of corruption. Eventually the sexist comments feel less like commentary and more like window dressing. If it seems like I’m frontloading on the story here, that’s because the game does too. Almost every day starts with one of these long cutscenes, before finally letting you get to the game map. This is where you’ll spend most of your time, dispatching officers to calls as they come in. There’s a pleasing rhythm to it, trying to send just enough officers to deal with each incident while keeping some in reserve for an emergency. When a cop gets to their destination there’s a little choose your own adventure moment, where you can use their skills and equipment to arrest a suspect or calm down a situation. The big showpiece addition for the sequel is tactical missions, full scale SWAT assaults where multiple officers participate in an XCOM style isometric turn based combat. The big showpiece addition for the sequel is tactical missions, full scale SWAT assaults where multiple officers participate in an XCOM style isometric turn based combat. There’s novelty in just how many non-lethal options the game presents you with, giving you ample chance to capture enemies rather than killing them. Except I saw little feedback on that choice—a bloodbath was treated the same as a perfect run. The main case for avoiding a gunfight is that the combat is incredibly lethal, and often results in multiple dead officers. Ultimately the new system sits awkwardly alongside the main game, with numerable small town crimes punctuated by a mass bomb threat or hostage situation every few days. Like if every third episode of The Wire was suddenly 24. Later on as corruption becomes a stronger theme the necessity to earn cash by sending officers to moonlight becomes more important. There’s even a system for buying and selling various goods to try and turn a profit. If all this seems overstuffed, it is. At times it feels like the game is asking you to spin too many plates at once, which only increases the chances of them crashing down. You see, This Is The Police 2 is hard. Very, very hard. The various systems make it incredibly easy to enter a fail spiral. If you don’t have enough cops you can’t respond to crimes, and if you can’t respond to crimes you can’t earn ringpulls (inexplicably the department’s main currency) for new cops, which means you can’t respond to crimes, and if you don’t earn ringpulls for three days running it’s game over. It’s also game over if you can’t pay off the guy who is blackmailing you, which means you need to be racking up the corruption money even as you’re desperately trying to keep Sharpwood free of crime. In fact I have to confess that this review comes with the caveat that I haven’t seen the end of the game, simply because I’m not good enough to get there. And this is coming from a guy who thought XCOM 2 wasn’t that hard. I haven’t played the first This Is The Police, but I can’t help but feel like the sequel simply adds too much. The game feels like it needs to refocus on the day to day policing and the small storylets that accompany it, which are great. Unless the message is that running a police department is an impossible task, in which case: mission accomplished.